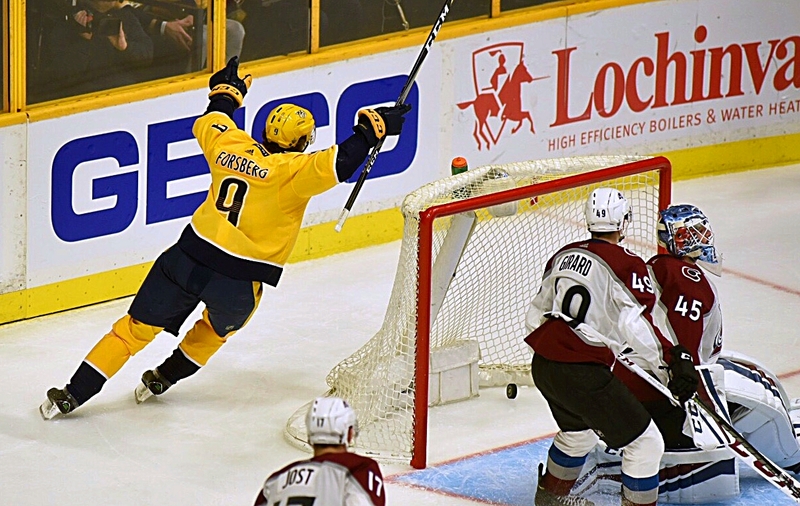 NASHVILLE, Tenn. (AP) — Filip Forsberg scored twice in the third period and the Nashville Predators rallied to beat the Colorado Avalanche 5-2 on Thursday night in Game 1 of the first-round Western Conference series. The Predators were ready for a big party having won their first Presidents’ Trophy and looking for the Stanley Cup lost in six games to Pittsburgh last June. The Avalanche simply wanted a big win on a stage their franchise hadn’t seen since 2014, and the youngest roster this postseason outplayed the defending Western Conference champs early. Nikita Zadorov and Blake Comeau each scored a goal for Colorado. Forsberg, who led Nashville with 64 points in the regular season, gave Nashville its first lead of the game at 3-2 when he redirected a shot from captain Roman Josi past Jonathan Bernier at 6:08 of the third. Then Forsberg made it 4-2, passing the puck through his legs skating by rookie Samuel Girard before beating Bernier with 7:50 left. 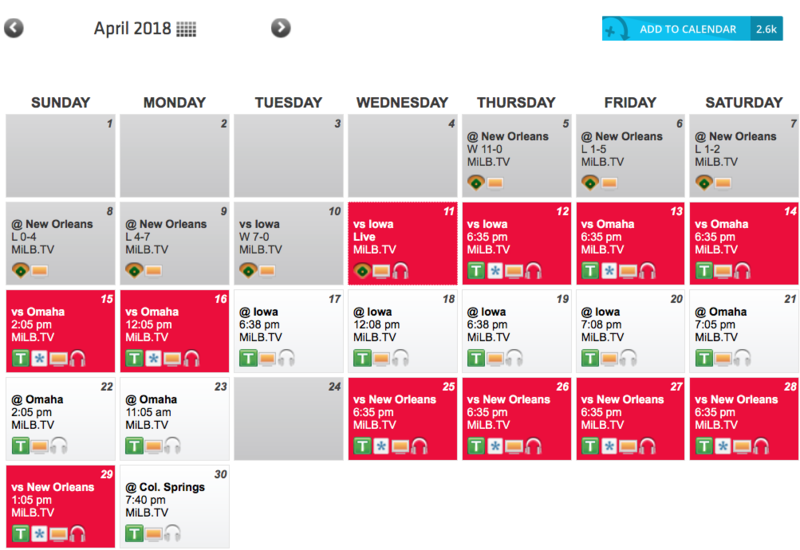 This series featured a team that won a record 53 games during the regular season and Colorado, which had to win its regular season finale to squeak into the postseason a point ahead of St. Louis. The Avalanche came in with only 14 players having any playoff experience, and their most season player Colin Wilson was on Nashville’s roster a year ago. 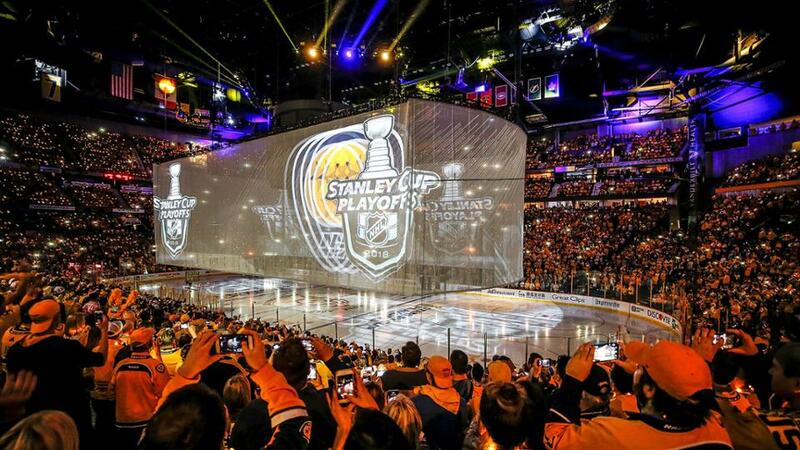 Fans filled the arena more than 30 minutes before the puck dropped, waiting for a pregame video that included a giant curtain that dropped down over the ice for a giant video board. 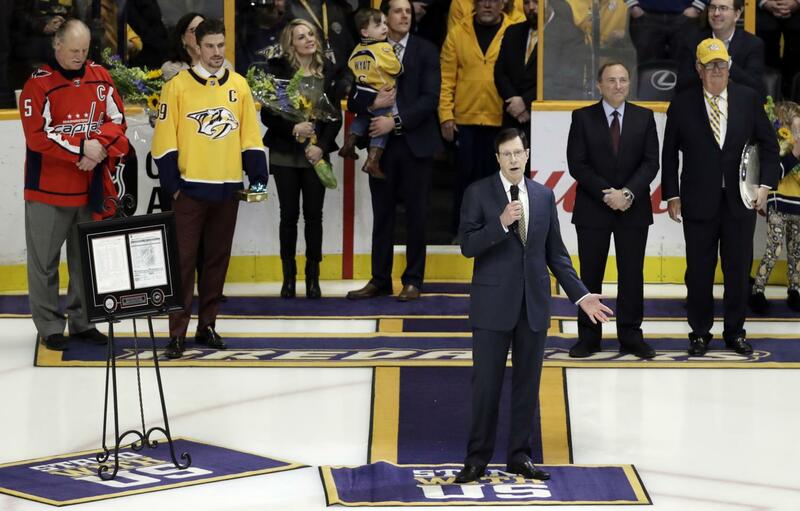 Rascal Flatts handled the anthem as the Predators continued their tradition of big stars stepping in for the postseason, and two catfish hit the ice almost as soon as the last note ended. Colorado scored on its first official shot as Rinne didn’t appear to see Zadorov’s wrister with the puck going over his glove at 6:36 off assists from Mikko Rantanen and MacKinnon. 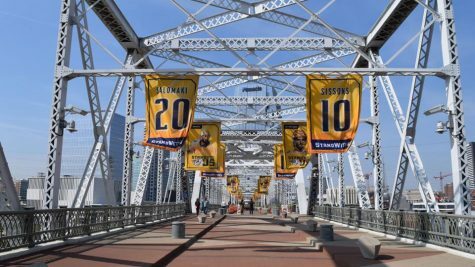 CLICK HERE TO READ HOW NASHVILLE IS TURNING GOLD! The team that led the NHL in penalties took two late in the first, including giving Colorado 19 seconds of a 5-on-3. 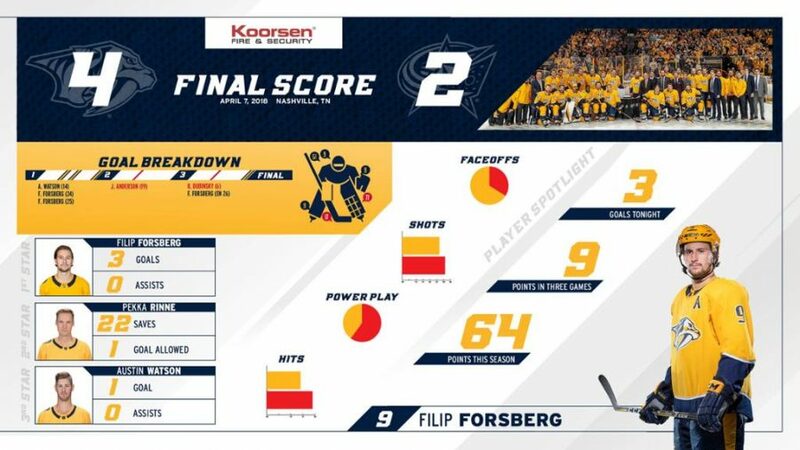 Rinne seemed to settle the Predators down with a big save with 20 seconds left in the period, stopping Tyson Jost’s shot from the slot before sticking his right skate to the postwith MacKinnon and Gabriel Landeskog trying to pounce on the puck. In the second, Rinne got help from Matt Irwin clearing J.T. Compher’s shot, and the Predators tied it up at 1 on a wrister from Watson that squeezed over Bernier’s left shoulder and the post at 3:14. The goal was being announced when Comeau got a stick on Carl Soderberg’s shot from the point to give Colorado a 2-1 lead at 4:51. 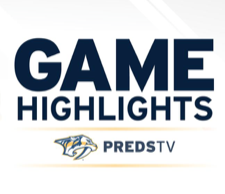 Rinne came up with his best save with 2:24 left in the second with Rantanen on a breakaway. The goalie spread out and stuck his right leg out, stopping the puck with his pad. NOTES: Nashville had been 12-14-5 after giving up the first goal and 8-10-2 when trailing after the first period in the regular season. But the Preds were 11-1-2 when tied after two periods. … Watson and Smith each had their fifth career goals of the playoffs. NASHVILLE, Tenn. — The Nashville Predators presented the President’s Trophy to the largest sold out crowd in the history of the Bridgestone Arena, wrapping up a regular season of play that is symbolically setting up a play-off season of high expectations. The franchise’s first Presidents’ Trophy brought a fan intimacy to center ice that has been a hallmark of the club for the last 20 years. And though the house was rockin’ with pride, it was definitely not the hardware the fans of Nashville hope to see hoisted in center ice a few months down the road. It’s time to chase the hardware the Predators really want: The Stanley Cup. The Predators accepted the Presidents’ Trophy before the game from NHL deputy commissioner Bill Daly and took a moment to remember the moment with a team photo on the ice. Fans then chanted “We want the Cup” for the defending Western Conference champs who lost the Stanley Cup in six games to Pittsburgh last year. Nashville coach Peter Laviolette said he’d never coached a team that won the Presidents’ Trophy before. 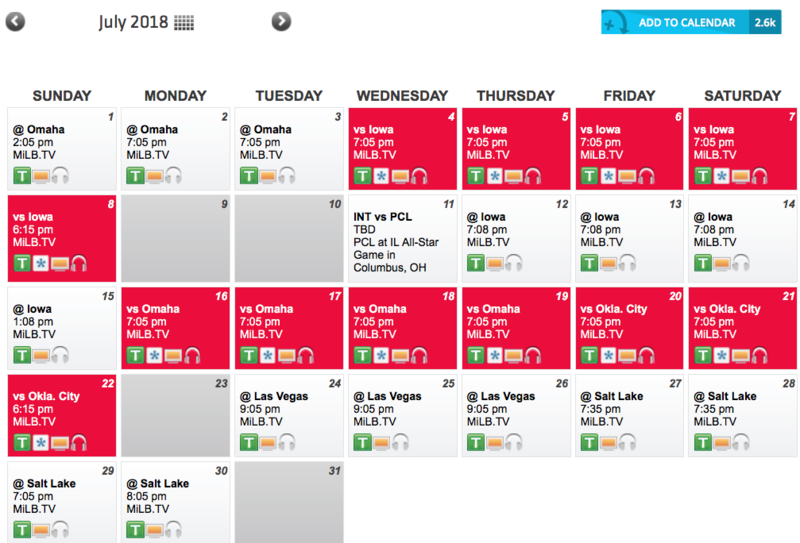 Indeed it has been a season of firsts through out this entire year. The Nashville Predators are having a record breaking season this year, coming off of a 10 win streak, here are just a few of thier current accomplishments in the 217/18 season. 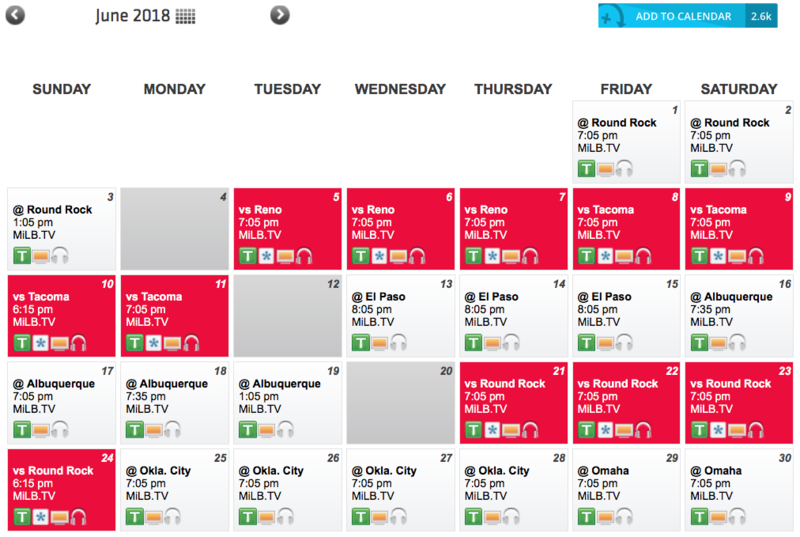 A regular-season Western Conference crown. The Presidents’ Trophy as the League’s top point-getter. Franchise records in points and victories. And they’re still not done. 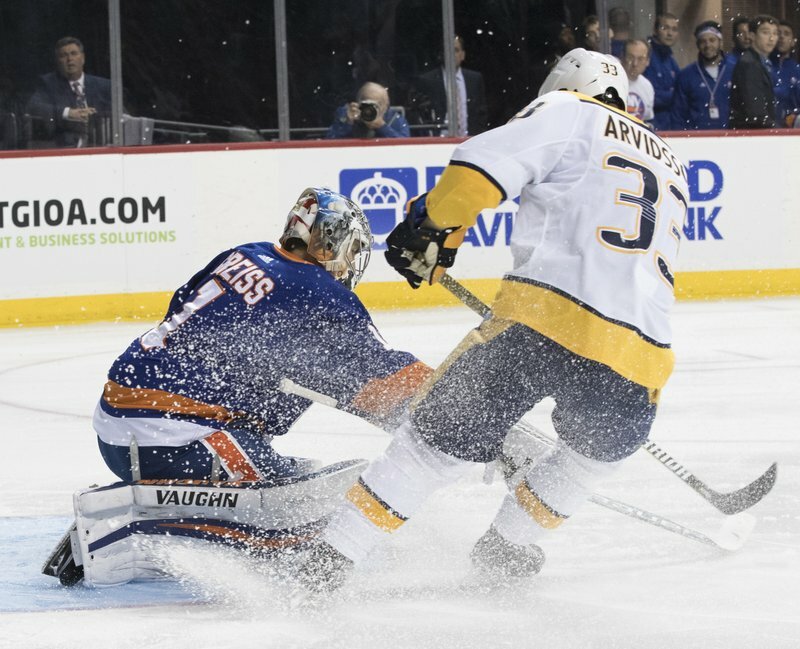 Predators went nearly a month scoring a point in every game, for a streak of 15. 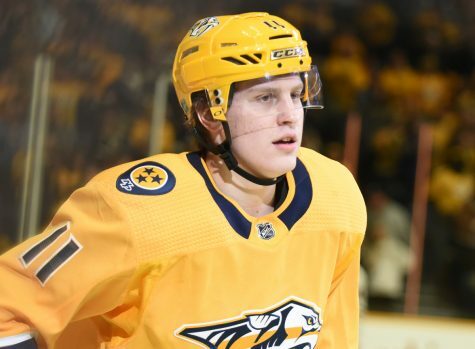 DENVER — The Preds are in! 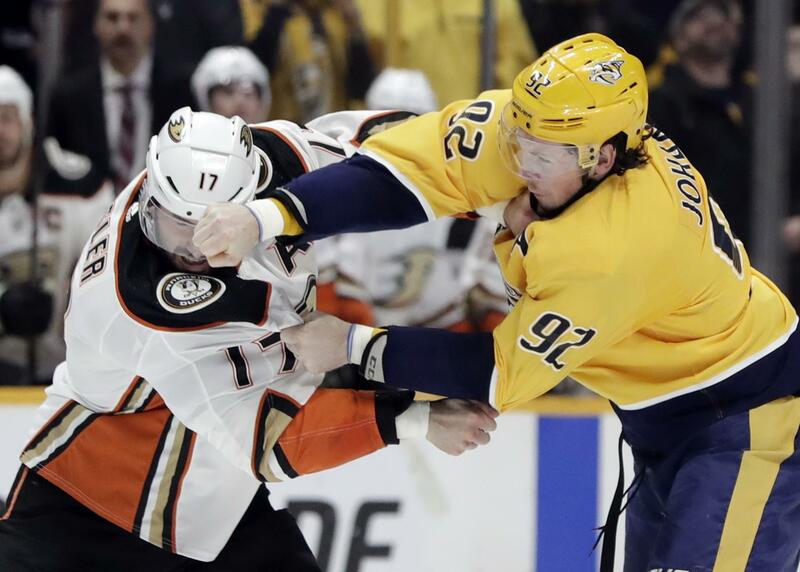 The Nashville Predators didn’t break out the bubbly or anything rowdy like that after becoming the first NHL team to clinch a playoff spot this season. 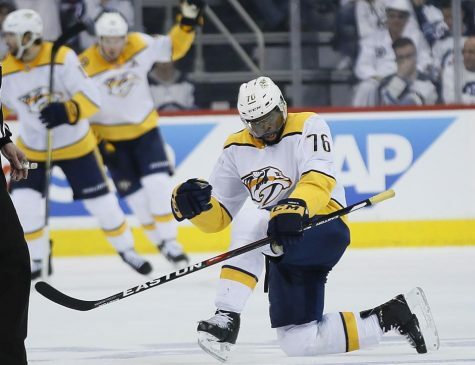 With their win against Colorado, the predators are first in going into the Stanley Cup Playoffs and Monday night’s win against the Sabres extends the point streak with the Pred’s win, 4-0. 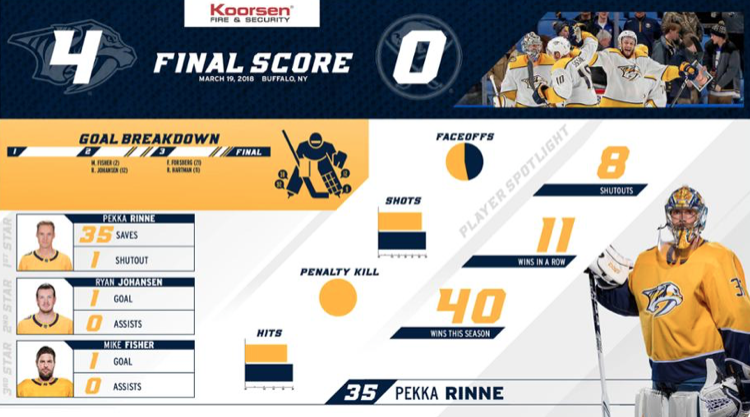 Pekka Rinne earned another shutout with 35 saves. In addition, The Predators only need fewer than 10 more points in their final 11 games to top the franchise record. 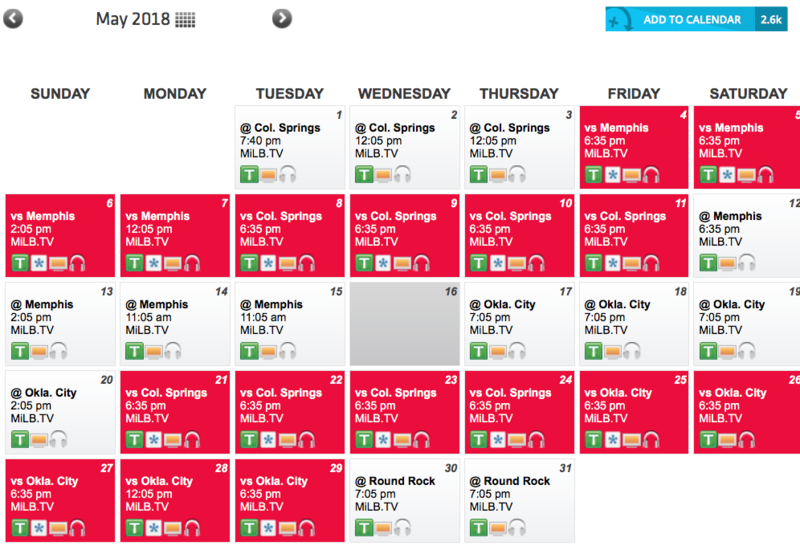 Nashville is coming in hot to the playoffs. They have 106 points as of Monday night and continue to stay on top being chased by Tampa Bay who is second overall in the league. 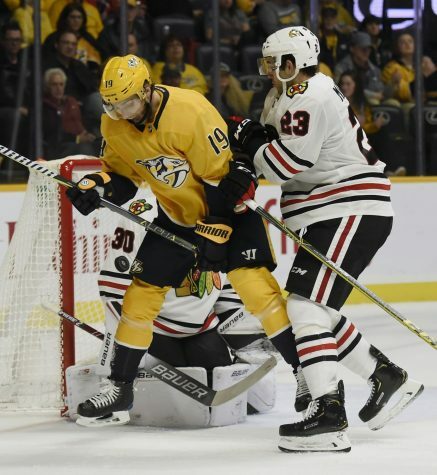 The streaking Predators are 13-0-1 in their last 14 games and haven’t lost in regulation since Feb. 17 against Detroit. Starting goalie Pekka Rinne was given the night off after helping Nashville to a win Thursday at Arizona. MacKinnon nearly tied the game late in the third period, but his shot hit off the shoulder of Saros. 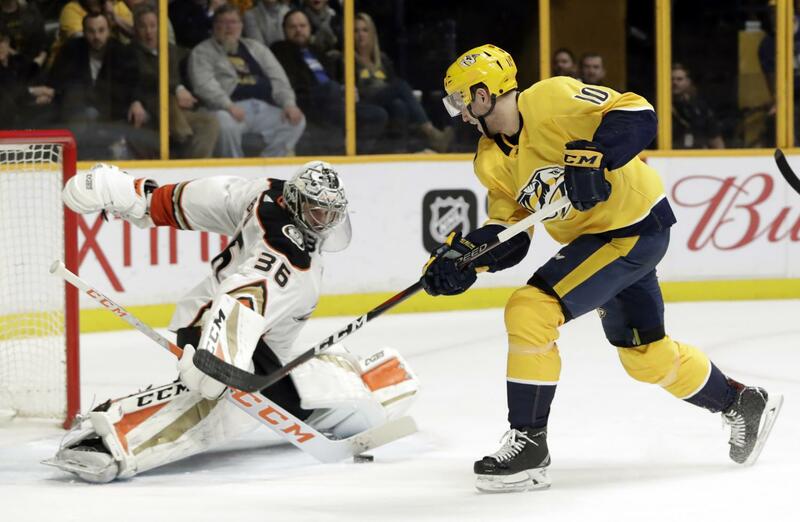 Nashville weathered two penalties by P.K. Subban in the final period. Colorado pulled Varlamov in the final two minutes and it led to a game-sealing goal by Forsberg into an empty net with 1:09 remaining. The Preds also extended their team-best road winning streak to nine straight. They haven’t lost in regulation since a 3-1 defeat to Detroit at home on Feb. 17.; And they improved to 12-0-3 in their past 15 road games since a 3-0 loss at Vegas on Jan. 2. 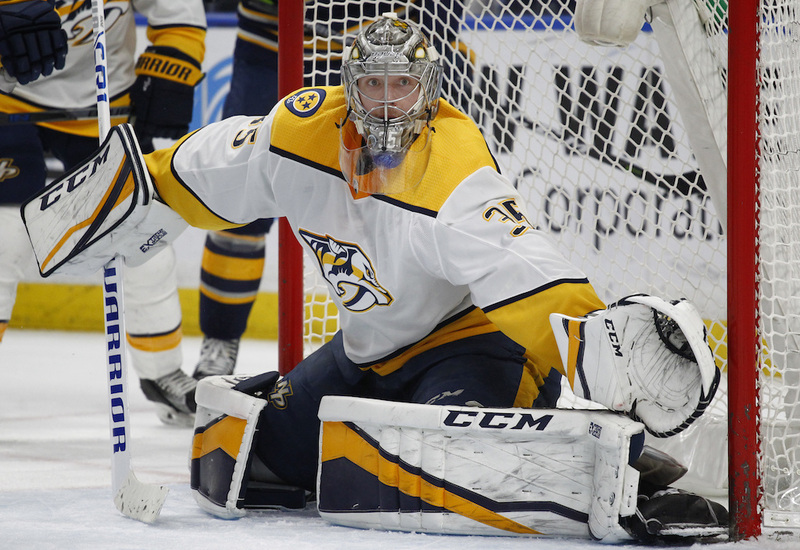 Rinne won his 11th straight to match his personal best in a stretch in which he’s allowed just 18 goals. The shutout was the 51st of his 12-year career and third in nine games. 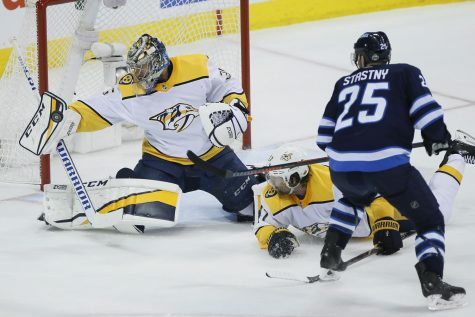 And Rinne also improved to 40-9-4 in becoming the NHL’s seventh goalie to win 40 games in a season three or more times. 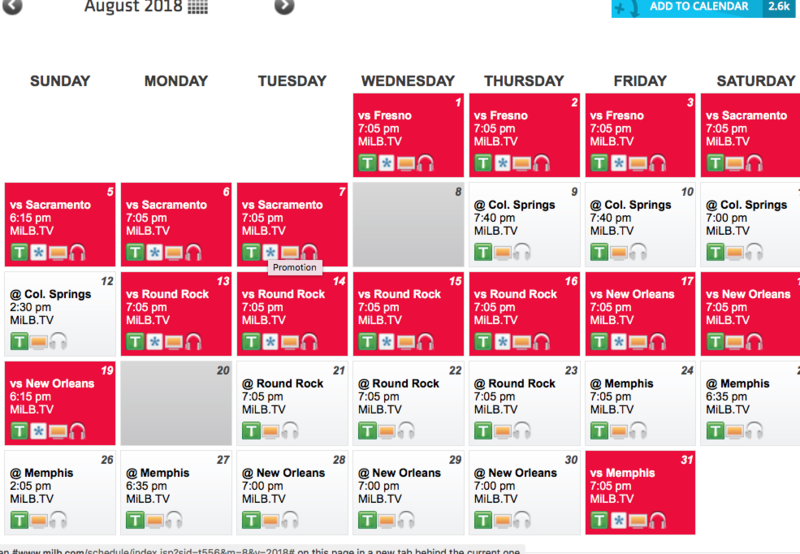 Looking Forward to Thursday’s Game. Rinne joined a list of three-time 40-game winners led by former New Jersey goalie Martin Broduer, who reached the milestone eight times. Washington’s Braden Holtby is the only other active goalie to win 40 games three times. The other three-time 40-game-winners were Terry Sawchuk, Jacques Plante, Mikka Kiprusoff and Evgeni Nabokov. … Sabres RW Kyle Okposo returned after missing three games with a concussion. … With 10 games left, the Predators inched closer to matching franchise records for most wins (51) and points (110) set in 2006-07.